North Carolina, c'mon and raise up... your glass, because it's NC Beer Month! Now that UNC-Chapel Hill has brought home another NCAA basketball championship, it's even more exciting and fitting to give you Carolina-Style Beer Chili Hot Dogs. 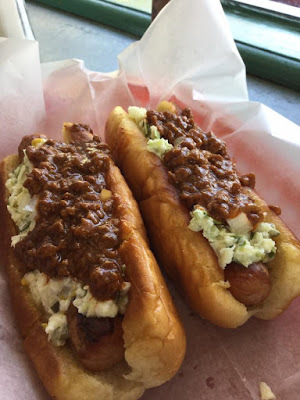 Chili, coleslaw, onions, mustard and sometimes cheese and ketchup make up Carolina Style toppings that every North (and South) Carolinian calls "all the way" when asked what we want on our burgers and hot dogs. It's comforting knowing that wherever you go, everyone knows what "all the way" means. North Carolina is one of the best states for craft brewing. We have more breweries than Virginia, West Virginia, Tennessee, South Carolina and Georgia COMBINED. And new ones are cropping up and popping up every day. We have award-winning breweries that boast multiple medals from the Great American Beer Festival and The World Beer Cup, a rich craft beer history and potential to set standards for the future. I'm setting a standard right here: adding beer to make the chili more dynamic and have a deeper flavor. Whether you're making 'em for lunch, a snack or dinner, your hot dogs will never be the same. Mother Shucker Stout is a collaboration between Front Street Brewery in Wilmington and NoDa Brewing in Charlotte. Black Mocha Stout from one of NC's oldest breweries, Highland Brewing, boasts with roasty, toasty malt flavor and a clean finish. 1. Heat the olive oil in a pan over medium high heat. Add the onions, cooking until lightly browned, about 5 minutes. Stir in the garlic. 2. Add the beef, cooking until browned, stirring and breaking it up as it cooks. 3. Stir in the beer, tomato paste, Worcestershire sauce, chili sauce, chili powder, smoked paprika, salt, pepper and cumin. Cook until slightly thickened, remove from heat. 5. Open the hot dog buns and lay flat, cut side up, on a baking sheet. Place under broiler until lightly toasted (this will help the buns to not get soggy once the chili dog sauce is added). Remove from oven, lower heat to 400F. 6. Place the buns in a long row down the center of the pan. 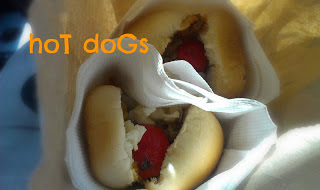 Add a hot dog to each bun, top with chili. Sprinkle the hot dogs with cole slaw.